This stylish timepiece by seiko features a 6R15 Automatic movement housed in a 40.5mm case. With bold white dial and oversized numerals, blue hands and brown leather strap. From their very first watch in 1913 to the very latest creations of today, Seiko have continuously honed their skills, increased the precision of their manufacturing and developed new ideas and components in their own unique Japanese style. The source of their strength is their craftsmanship. For the purists who appreciate the finest watchmaking, we proudly present Presage. Seiko offers a great range of watches, from fashion to sport and technical timepieces styled in the most up-to-date design. 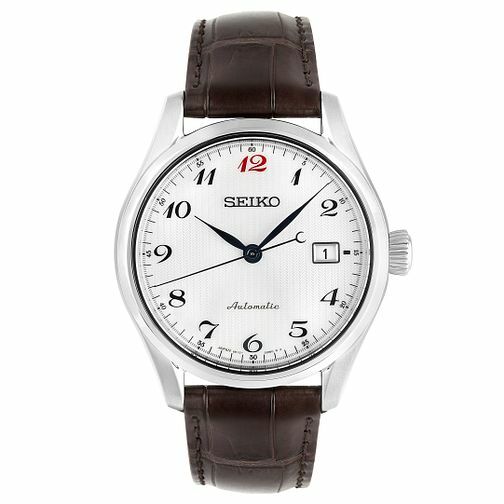 Seiko Presage Men's Brown Leather Strap Watch is rated 5.0 out of 5 by 1. Rated 5 out of 5 by Anonymous from Beautifully crafted automatic watch stunning dial and looks lovely with a brown strap. Seiko really does provide tremendous value for an extremely well built automatic watch.